Opening hours: The general opening hours for shops are 10am-9pm every day, and often even longer for malls, although some shops close for lunch. Banking hours are usually 9am-5pm from Monday to Friday, and currency exchange kiosks (Obmin Valut) are open 9am-9pm daily. ATMs (Bankomats) can be found plentiful throughout the whole city. 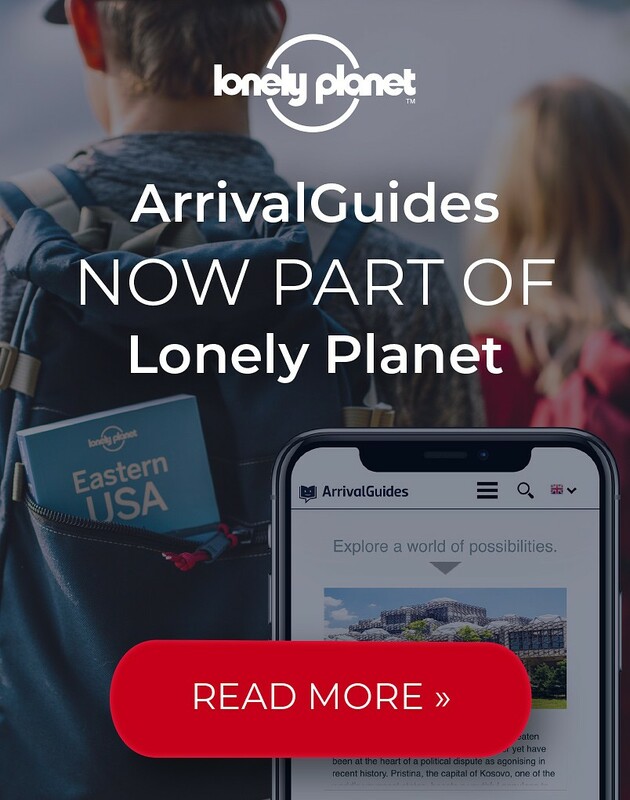 Tourist information: Travelers may refer to any of the multiple Tourist Information Centers (TICs) located all over the city – free maps and guides are at your disposal and the staff is usually multilingual. Walking along Kiev streets, one can witness many eras collide: Soviet architecture alongside orthodox cathedrals, and imperial palaces define the Ukrainian capital that has recently been shaken by quite a bit of political turmoil. 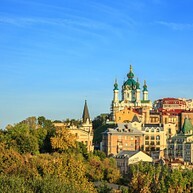 Kiev has now embraced modernity and has a lot to offer – its eclectic art and cultural scene can keep busy for days on end, so make sure to plan your route ahead. 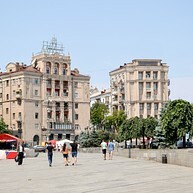 Seat of the Orange Revolution, Kiev’s big social heart hosts many concerts, performances and festivals, and it is thus known for its vibrant and lively atmosphere. Surrounded and embellished with fountains, monuments and an underground shopping mall, this is where real life happens. This monastery is a historic pilgrimage place and an UNESCO World Heritage Site, housing amazing churches, museums and eerie monastery caves. 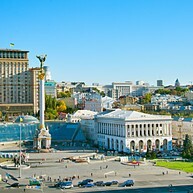 In 2007, it was also elected as one of the Seven Wonders of Ukraine. The picturesque and steep cobblestone hill Andriyivsky Uzviz, meaning "Andrew’s Descent", is lined with souvenir sellers and artists. Historic landmarks, for example the Castle of Richard Lionheart, are spread out along the descent and they all a great sight. This 11th-century cathedral, now being a museum, is adorned by stunning mosaics and impressive frescoes. Together with the Kyiv Pechersk Lavra, this one is listed on the UNESCO World Heritage List. The National Museum of the History of the Great Patriotic War is a great place for getting a profound understanding of Kiev´s history and the impact it has made on the country today. This museum has both an indoor section and a big outdoor section with monuments and statues. 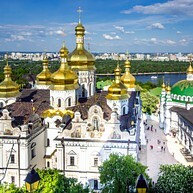 St. Michael’s Golden-Domed Monastery lies on the Dnipro river bank and it boasts soaring domes, mosaics and memories. It was built in 1713 and it has been complemented as well as rebuilt and reconstructed several times since. 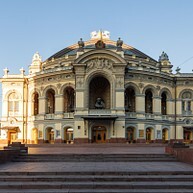 As one of the oldest building of the Ukraine, this historic Opera House invites you to an evening of classic opera or ballet, and the fabled mastery of its performing artists along with the stately ambiance of the building itself will make for a decidedly unique night out in Kiev. Prices are reasonable and the seating is good. but make sure to book in advance, as popular shows tend to get sold out early. 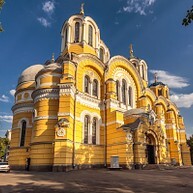 St Volodymyr’s Cathedral is a busy, boldly frescoed 19th-century church in the city center and a memorable landmark. It is the most important cathedral for the Ukrainian Orthodox church. 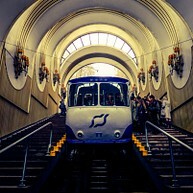 The funicular, connecting the district Podol with the upper part of the city, is an authentic and functional monument to Kiev's historic past and just another means of public transport for locals. Get in on the lower station (Poschtova Ploscha) and up to Andrew's descent and the upper station (Mykhailivska Ploscha) to save yourself a tiring climb uphill while taking in the spirit of the ages and also a great view. 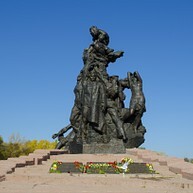 The Babi Yar ravine is a sobering memorial to the people massacred during the Nazi occupation. It is estimated that – at this very place – more than 100.000 people lost their lives. The House with Chimaeras – also called the Gorodetsky house, after its creator – is mainly used by the government but even though it is closed to visitors, the facade alone makes it worth the trip: its exterior is generously decorated with sculptures of various animals and even sea monsters, and it gives the place a very eerie, yet enticing vibe. One of the most ambitious projects on the Ukrainian art scene, Mystetski Arsenal, is a former military factory turned into National Art and Culture Museum Complex. 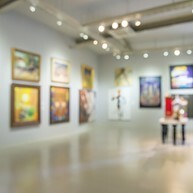 Although contemporary art is in focus here, past exhibitions have already featured works of great masters such as Chagall or Picasso as well. 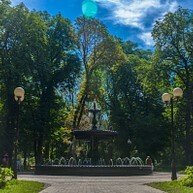 This fabled park bears traces of its imperial heritage, and it is most certainly worth a visit: apart from a leisurely stroll, you can enjoy one of the best views over the Dnipro river and also take a look at the Mariinsky Palace, the baroque ceremonial residence of the Ukrainian president. The National Museum of Ukrainian Architecture and Culture is Europe's biggest open air museum. Here you will get an insight in Ukraine's culture, history and all of its historical ethnographic regions in a fun and interactive way. This museum is located in the heart of Kiev and it boasts an impressive collection of up to 12.000 paintings: ancient icons and famous Russian artists'pieces that come from the former home of art-collecting aristocrats.